We recommend using the infrared radiant heater IRD 2400 wherever there is a need for elegant solutions for the additional heat distribution in architecturally sophisticated interior spaces and outdoor areas. Where conventional devices are fitted with a visible, brightly illuminated heater tube, this radiator can generate the comforting infrared heat by means of a covered stainless steel heating coil enclosed in aluminium – the heat source is shielded from view. Since the IRD 2400 emits its radiation energy mainly in the medium- and long-wave infrared spectrum, it can distribute heat in an even and targeted manner without heating the ambient air. The device also proves to be a superior product for use out of doors, seeing as it comes with IP55 type of protection which makes it dust-, splash- and water-jet-proof. Accordingly, the device is ideally suited for use in outdoor areas that are sheltered from the wind such as balconies and terraces. As such, it can be applied in the catering trade but also in interior spaces, e.g. in indoor swimming pools, marquees, conservatories or rooms that are only used sporadically. With the innovative and aesthetically pleasing design of the elegant aluminium housing the infrared radiant heater is clearly the first choice – both for use in the refined catering trade or in a neat private ambience. Owing to its simultaneously minimalistic and classy design the device fits in seamlessly with any environment and, moreover, resembles the key to an inherently consistent lighting concept. For the additional bright red light of “normal” IR radiators would be utterly disturbing when it doesn't match the present lighting concept. With its heating capacity of 2,400 W the high-performance infrared radiant heater provides cosy warmth both indoors and outdoors, it can be set to 3 heating levels – using an IR remote control if desired – so as to cover an extensive heating range. The inclination angle that can be adjusted by 90° further enhances the effective range. The IRD 2400 generates heat in a clean, condensation-free, odourless and noiseless way without raising dust – which makes it suitable for allergy sufferers. A 24-hour timer, the operation indicator light and an LED display complete the equipment of the maintenance-free IRD 2400. The infrared radiant heater require very little maintenance, since there is no need to exchange tubes. An appropriate holder for mounting the device to the wall or ceiling is included in the scope of delivery. 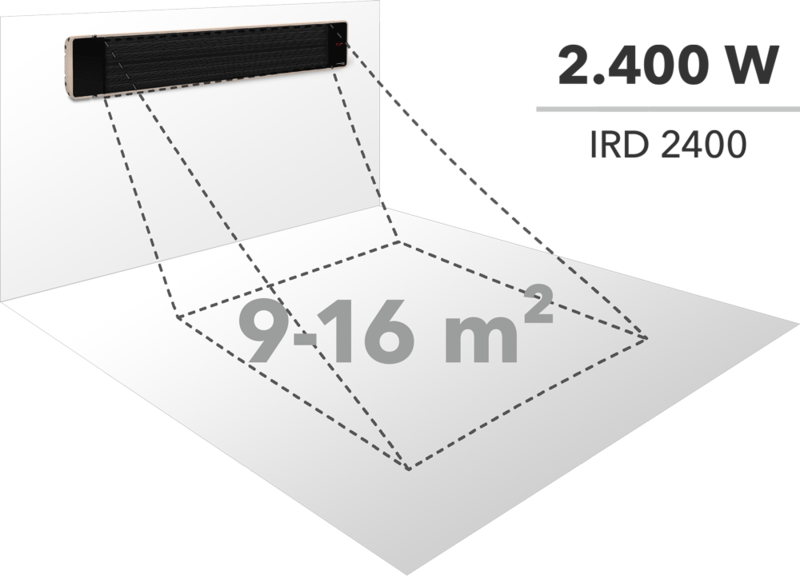 The infrared radiant heater IRD 2400 is supplied in TÜV-tested quality, thus guaranteeing high value, safety and functionality and making sure that you are always on the safe side with Trotec brand quality. The supplied remote control renders the operation of the IRD 2400 particularly convenient. You are tempted to spend long evenings on the terrace? With the IRD 2400 you’ll experience agreeable, summery nights even in the time between seasons. Do not allow cold nights to spoil a cosy get-together on your terrace, balcony or in your conservatory. The tinted radiator is the first choice in its elegant aluminum design housing as an innovative and aesthetically successful solution - both for use in the upmarket catering sector and in well-kept private environments. The IRD 3200 has a uniform and targeted heat distribution, so no energy is wasted to the ambient air. The tinted radiator with its large heating power is nevertheless very energy efficient.